DLO's TuneStik wwith Remote could be the in-car iPod accessory to top all others. 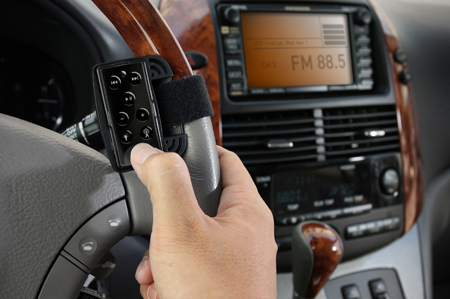 The product combines a dock-on FM transmitter to beam your songs to your car stereo, and a radio remote you can clip to your steering wheel. So no more groping for your ipod to change channels and no need to install a price direct-to-stereo link either. The TuneStik itself has a dock pass-through port, so you can still connect the iPod to a power source and/or other add-ons. And since a regular iPod can still be connected directly to a hi-fi or car cassette adaptor via the earphone socket, you're not limited to using the remote control to tune the FM transmitter. 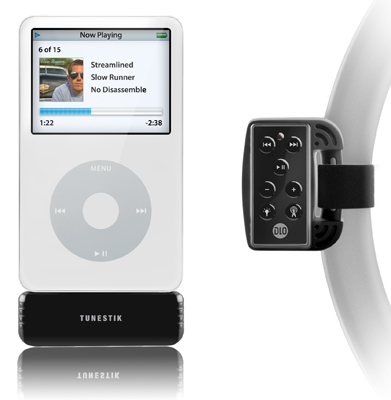 For in-car use, the TuneStik comes complete with a steering-wheel cradle for the remote control, so you can easily and safely navigate your iPod controls while driving. The TuneStik and Remote is availble now for $60 from DLO's website and iPod retailers.